You probably already have one on hand in your Springs luxury apartment home, but keep a separate kit reserved exclusively for emergency use. A bad storm is not the time to discover you're out of band-aids or Tylenol. With your body being composed of 60 percent water, it's no surprise that you need a steady supply of fluids. A case of water is preferable, but if that's not possible, put aside at least a few two-liter bottles. Don't forget to include a manual can opener and utensils! In addition to providing warmth, blankets can help make you more comfortable. If you have room, you may want to add a couple of pillows as well. Power outages are a common result of storms. Include a spare set of batteries and get in the habit of checking them at least every 6 months. Lack of running water also makes personal hygiene difficult. Wipes and towelettes allow you to freshen up while they help to prevent germs. Plastic sheeting provides a stop-gap measure against moisture from drips and leaks. Pets can easily become agitated during bad weather. Have a supply of food along with a leash or carrier to keep them under control. Don't assume that cell service will be available. A whistle or horn lets you signal for help if necessary. When you clean out your closet, save an old outfit or two and a pair of sturdy shoes for emergency use. 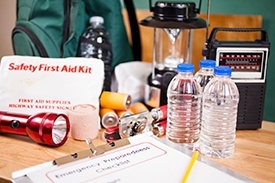 Emergency radios with hand-cranks are relatively inexpensive, require no batteries and allow you to charge cell phones and other USB-compatible devices. Do you have any bad-weather survival tips to share? Tell us in the comments!